McArthur-Burney Falls Memorial State Park campground has 104 campsites located within walking distance of the world famous McArthur-Burney waterfalls. The campsites can accommodate tents, trailers and RVs (up to 32 feet). The campground has drinking water, flush toilets, hot showers and a dump station. Boat rentals are also available and there is a boat ramp at the Lake Britton. Cabins and hike/bike campsites are also available. McArthur-Burney Falls Memorial State Park also has a visitor center, camp store (with snacks, supplies, ice and firewood), picnic areas and hiking trails. The spectacular 129-foot Burney Falls is the big attraction here and is said to be the prettiest in all of California. Even Teddy Roosevelt described Burney Falls as the “eight wonder of the world.” You can view the falls from a parking lot or take the 1.3 mile trail that circles the falls. There’s also plenty other wonderful places to explore within the 910-acre park like Lake Britton. Outdoor activities include canoeing, kayaking, swimming, photography, hiking, horseback riding, windsurfing, picnicking and wildlife viewing. You can also scuba dive or snorkel in the lake. Lassen Volcanic National Park is about 30 miles to the south. 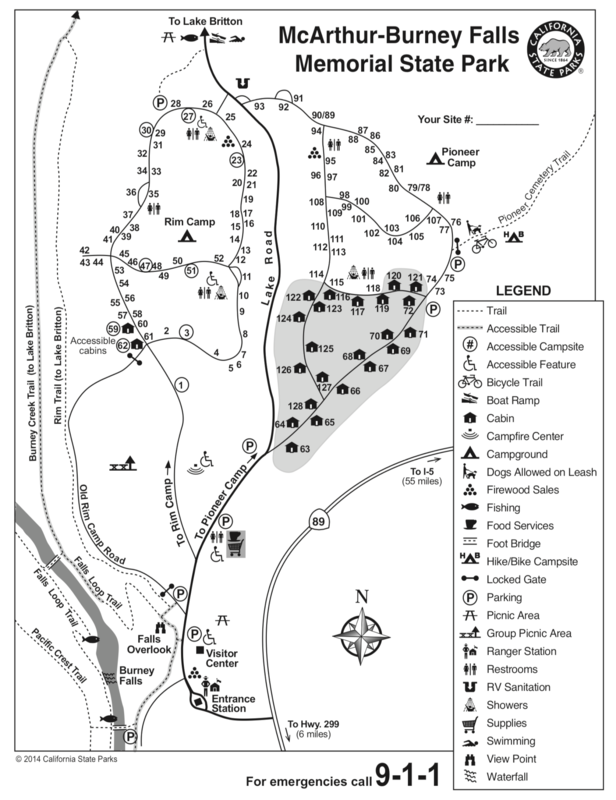 It has 4 campgrounds including Summit Lake South, Summit Lake North, Crags and Manzanita Lake. 24, 44, 57, 73, 84, 90, 115. Visted McArthur Burney Falls Memorial State Park Campground lately? We'd love to hear about your adventure. Did you find us useful? Did we forget something? 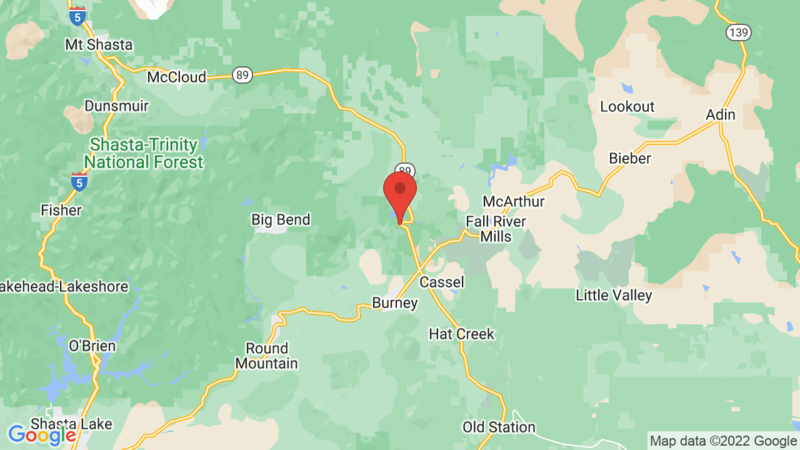 Anything our community should know before heading out to McArthur Burney Falls Memorial State Park? These have to be the most amazing falls in CA. We walked along the trail that goes all the way around the falls and we also went down onto the rocky floor near the falls to feel the spray from the falls. The amount of water pouring down is mind blowing. It’s also fun to sit and watch for birds to come darting out from behind the waterfall curtain. The camp ground is nicely spread out. Pretty good facilities. We stayed in a cabin that was good for two people and gear. It was too close to the road, however and the sound of trucks would keep you awake if you didn’t have ear plugs. there is a squirrel problem at this campground. They have been fed by humans so much they are not afraid of them. We had to resort to water bottle tactics in the evening. Use the critter locker! Nice, clean park. Beautiful falls and lots of walking trails. PCT runs right through it. Heads up for campers- We found out at check-in that sites 78 & 79 are buddy sites and share a common driveway so no privacy between them. Reserve America does not indicate this detail when booking either of those site numbers. Generators may be operated at McArthur Burney Falls Memorial Park, but only from 10 a.m. to 8 p.m.
Are the fire rings and grates suitable for grilling? How far is the walk to the lake? Can I drive there from the campsites or is there alternative transportation for disabled people? The fire rings and grates at McArthur Burney Falls Memorial State Park campground are not the best for grilling (the distance between the slats is about an inch), but you should be able to grill hotdogs, burgers, chicken and steaks, etc. Remember to get your fire and embers really hot before trying to grill anything. Also, Lake Britton is about 1.2 miles from the campground and you can walk, bike or drive your car on Lake Road to the Burney Creek Pier parking area (next to the lake). Are pets allowed at the campsite? Yes, pets are allowed at the campsites at McArthur Burney Falls Memorial State Park. They just need to be on a leash at all times. can i rent a handicap site even though i am not handicap? what is the difference between them and the other sites? we have a 31 ft rv.. will it fit? Only vehicles with ADA/handicap license plates and/or stickers are allowed in ADA/Handicap campsites. Generally a handicapped/ADA site will be paved and have other features to make the site more accessible for individuals that are disabled.